I realize news outlets (and for that matter, news-cycle blogs) have to go with what they’ve got, but I hope a few eyes were rolling over the weekend at the Great Debate Debate of 2015, said to be a rallying point for the vast Republican presidential field that was “rebelling” against CNBC and “uniting” to demand less challenging formats for future sponsors (with the exception of the sainted Fox News). “If you can’t exert bladder control for two hours, maybe you shouldn’t be president of the United States,” he cracked. A new litmus test for candidates! If you do the math with ten candidates, and assuming (as you should not) no “leakage” via candidates exceeding their time, you’re looking at 100 minutes of non-interrupted candidate talking points. 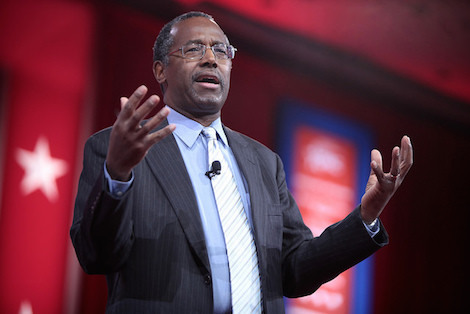 If you also, as Carson earlier demanded, a two-hour cap on the whole show, and work in commercials, yeah, there’s not any time for “debating.” This is, of course, a guy who thinks any criticism of his wacky world-view is an effort to repress him and take away his liberties, so it’s no wonder he’s hostile to the very idea of being questioned. In any event, since the next debate is on Fox Business, which is also not to be questioned, the debate debate will probably fade away until such time as it again becomes convenient for a majority of the field.